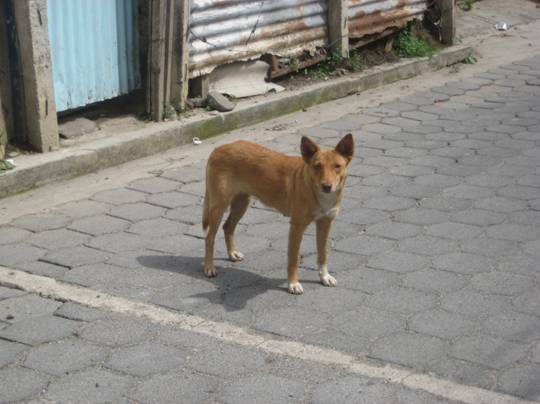 Bippy is a shy, small street dog from the Jucanya side of Panajachel. There is a small crew of dogs here that look just like her, including my own dog Bali and a recently neutered male named Skippy, that’s how she came to be called Bippy. I had been feeding Bippy for a few weeks in my new neighborhood in Jucanya. Slowly she was beginning to trust me but still not enough to let me touch her. Then she went into heat. Poor Bippy is so small but was attracting crowds of up to 15 unsterilized males following her relentlessly, day and night throughout her heat period, which lasted about three weeks. 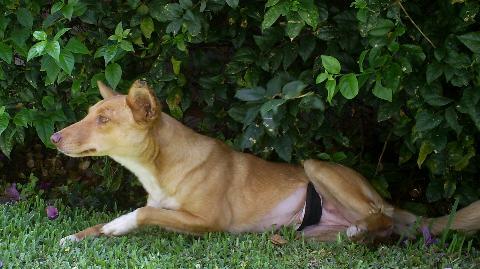 During those three weeks Bippy was surrounded without a moment to sit and rest unless she could hide underneath a car. The packs of males were extremely aggressive with each other as they pursued her and were having huge dog fights in the middle of the street. Neighbors say that some children were bitten in the chaos. I was able to lure Bippy into my yard on two occasions with food but both times she was so panicked and nervous that she found ways to escape out of the yard, returning back to the mob of males waiting for her. On one occasion both Selaine and Harold came to try and help me get Bippy into a cage but she was aggressive and terrified, so we decided it was best to wait until her heat was over to catch her. About a week or so after her heat subsided, Bippy was back to sunbathing on the shores of the lake and relaxing in her solitude when one day on my morning walk, she followed me home again. This time Bippy was more trusting and less frantic, so I was able, on my own, to lure her halfway into the cage with food and then shove her the rest of the way in. What a victory! I quickly got in a tuk-tuk still in my pajamas and drove through the river to Selaine’s house to drop her off for sterilization and still I made it to work on time! Bippy was sterilized, received the standard care package and spent a week recovering at Ayuda headquarters. She is now back with her human and fellow dog friends where her health will be monitored by Julia and a growing, caring community of Jucanya residents.